G Suite bundles a lot of great stuff. Company email, a full product suite, and document storage. It’s a good deal. For the value, I do believe it’s worth every penny. But the costs do add up. Let’s say you have 5 people at your company that all need email accounts. On the G Suite Basic plan, that’s $360 per year. For a small business that needs to watch every dollar, $360 does make an impact. What if you had 10 employees on the G Suite Business plan? That’s $1,440 per year. It really adds up. Is there a way to skip these costs entirely and get G Suite for free? Piece it together yourself using a free Gmail account. If you’re a Nonprofit, get G Suite Basic for free. If you’re a school, get G Suite for Education for free. Before we get into all the details on how you can get G Suite for free, is it worth the trouble? Less money spent on a software tool means more money to invest elsewhere in my business. One of the lessons that I’ve had to learn is that it’s possible to lose dollars trying to chase cents. It’s especially easy to lose sight of the big picture when trying to get a good deal on software. These days, I’m more inclined to pay for software that completely solves a problem for me. A simple subscription that handles all my company email, allows me to easily manage email accounts for my company, gives me a complete set of office software, and space to store documents, that’s a pretty good deal. Lots of problems go away instantly by purchasing G Suite. It’s cases like these where I make sure not to lose sight of the bigger win. My rule for buying an office suite is that it’s completely worth it as long as I have 2 or more employees that need company email accounts. Yes, I know how to hack things together in order to get G Suite for free but once I have a few employees to manage, the convenience easily outweighs the nominal cost of paying for it. Trying to jump through all those extra hoops to save a few dollars every month just isn’t worth it for me. At that point, I always get an office suite. G Suite isn’t the only option out there, Microsoft’s Office 365 competes with G Suite directly with an offer that’s very similar. We have an entire breakdown of G Suite vs Office 365 here. Personally, I prefer G Suite. It also gets much higher user satisfaction scores than Office 365 does. You can get access to all the G Suite products and a company email if you’re willing to do some extra work yourself. This works really well when you’re the only person working at your business. Or you have a small business where you don’t need to set up email accounts for your employees. You’ll sign up for a free Gmail account. 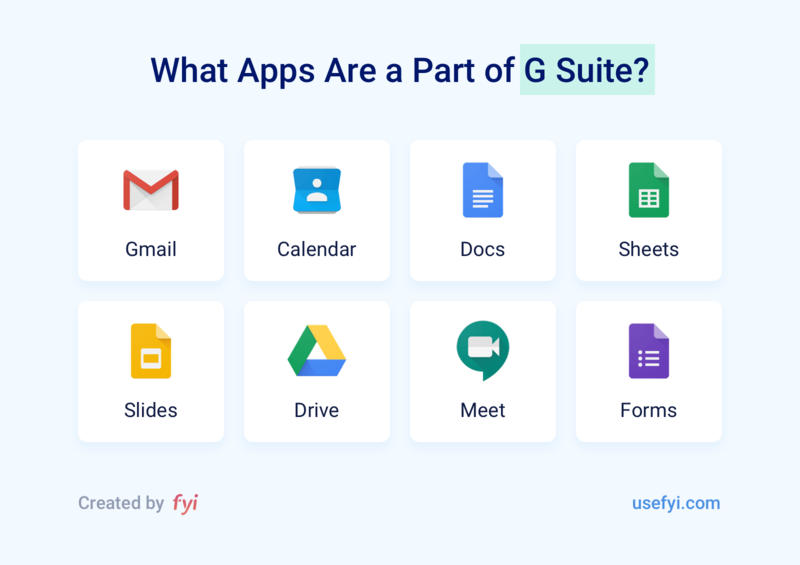 This also gives you access to the standard G Suite products like Google Docs, Slides, and Sheets. Then you’ll point your email to your Gmail account so that you can send and receive emails from that address through Gmail. First, sign up for a personal Gmail account here. Try to grab your-company@gmail.com if you can. If it’s already taken and you have to modify it slightly, that’s okay. This won’t be your public-facing email address anyway. You’ll primarily use it as a Google Account login and that’s it. You’ll also get access to Google Apps (Google Docs, Slides, and Sheets) along with 15 GB of storage space. Right there, you’ll have the majority of G Suite for free. The downside is that your email will be your-company@gmail.com. It works as a small business but doesn’t quite have the same professionalism as your-name@your-company.com. Any domain registrar will give you the option to create an email address on a domain that you own. Your domain registrar is the company that you used to purchase the domain of your company website, it might also be the web host you used to set up your company website. The settings are always slightly different depending on the exact domain registrar or web host. You’re looking for the email functionality once you log in. One caveat here, you might get charged extra for setting up an email on your domain. If you’ve purchased your domain through a web host, it often comes with basic email for free. If you don’t have any web hosting and only have a domain registrar, you’ll probably have to pay to set up email on your domain. You’ll still come out ahead though, it’ll be a lot cheaper than G Suite. In this example, the $20/year plan gives you what you need. After purchasing it, you’d configure it to direct all your email to your free Gmail account. One user on the G Suite Basic plan costs $72/year so you’d save $52 year by going with this option. You’d get everything that you need for a single email account at $9.88/year. That saves you $62/year compared with going with G Suite. 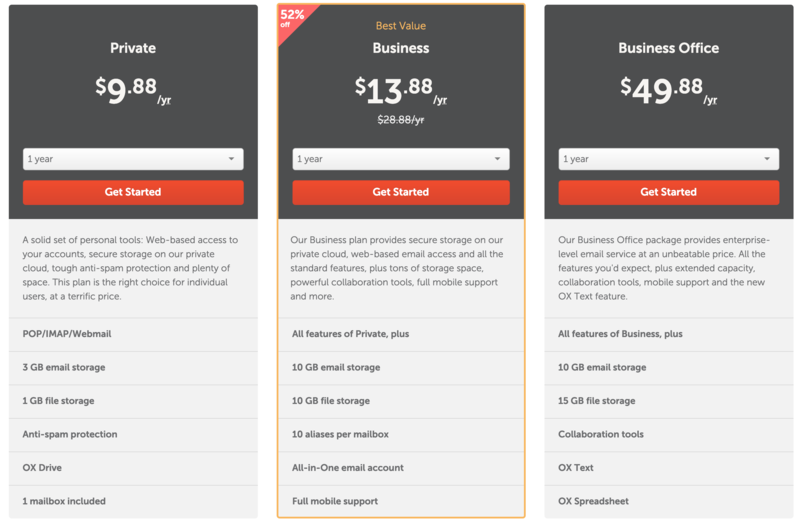 And Namecheap’s $13.88/year plan is pretty good too, allowing you to set up to 10 emails. All of these pricing tiers are much better than Hover. What about getting G Suite for free completely? Is that an option? Log into your web host account. Set up your email address in your web host. In the support docs of your web host, look up the settings that you need to connect your email to Gmail. Configure your email settings so you can receive and send email from within Gmail. Start using Gmail for all your email. 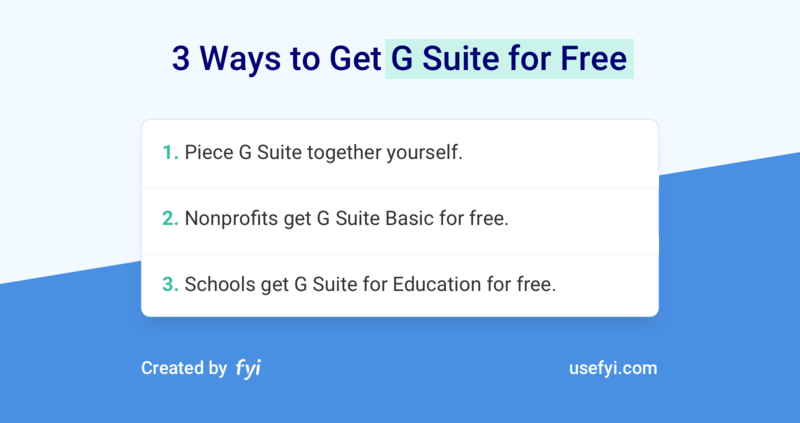 If you’re a nonprofit, you get to use G Suite for free. The non-profit signup page is here. No catches or tricks, it’s the full version of G Suite Basic. We have a breakdown of the G Suite pricing here which compares G Suite Basic to all the other tiers. The only limitation that could be a concern is the limited document storage. On G Suite Basic, you’ll be limited to 30 GB of storage per user. This is not a lot of storage and if you use Google Drive to store all your files, you’ll hit the limit pretty easily. One option is to supplement your free G Suite Basic plan with a Dropbox plan. That’ll give you more storage than you’ll ever need at a reasonable price and allow you to keep your free G Suite Basic plan. Google has a special edition of G Suite for schools called G Suite Education. There are two plans, a standard plan and an enterprise plan. The standard G Suite for Education plan is completely free. It includes email accounts for your school, the full product suite, unlimited document storage, and video conferencing. It’s an amazing deal. If you have a school and qualify for the free G Suite for Education plan, definitely get it. The enterprise version of G Suite for Education isn’t for free and includes extra administration features along with video conferencing for larger audiences. If you’re a larger institution, it’s worth looking at. If you’re a non-profit or a school, you’re in luck. You get access to a full version of G Suite without having to pay a dime. You’d have to pay for more advanced plans but you can get a great set of products on a free account. For the rest of us, it is possible to get G Suite for free if we’re willing to use a free Gmail account, access Google’s product suite through that Gmail account, and then connect our company email to that account. The storage is limited and we don’t get an easy way to manage users. That’s why I only recommend going this route if your company is pretty small. If it’s you and only one or two other people that need company emails, you can get G Suite for free. Remember not to lose sight of the big picture. I know I’ve spent too much time trying to chase discounts on products in the past. Once any of my businesses get to the point that I have a team of employees, I always subscribe to G Suite to free up my time for growing the business. If you are going to sign up for G Suite, check out our guide on The 7 Best Practices of a World-class G Suite Admin. That’ll help keep your G Suite account secure and your costs under control.